Previously I had posted about the Theoben Air Rifle of my fathers that needed an overhaul. Well I got chance to visit Dudley Rifle Club tonight which has a 25 yard, 4 lane indoor range. Not only was I trying out the rifle to see how well it shoots after it’s overhaul, I was also trying out my camera over wifi to see if I could make out where my shots are down range by looking at my phone screen. This would be a big help for my Target Rifle stuff so I wouldn’t have to line up my eye in the eyepiece of a scope, I could see from a glance. Anyways, these shots were taken from the firing point by using the WMU app from Nikon. Considering that I had completely stripped down this rifle, scope off, rings off and dismantled the entire action, I think that’s a pretty respectable first shot at 25 yards. The 10 ring is smaller than a 5 pence piece. in fact, the whole 9 ring is exactly the same size as a 10p piece. The shot in the 4 ring and outside the 1 ring are the result of me completely being a cartridge shooter. I accidentally loaded 2 rounds into the chamber, hence the low falling shots as 2 pellets got pushed out with the same amount of air. Oops! Another 12 shots into the middle target. I was trying to move the point of aim over, but there was a lot of vertical stringing and all to the left. 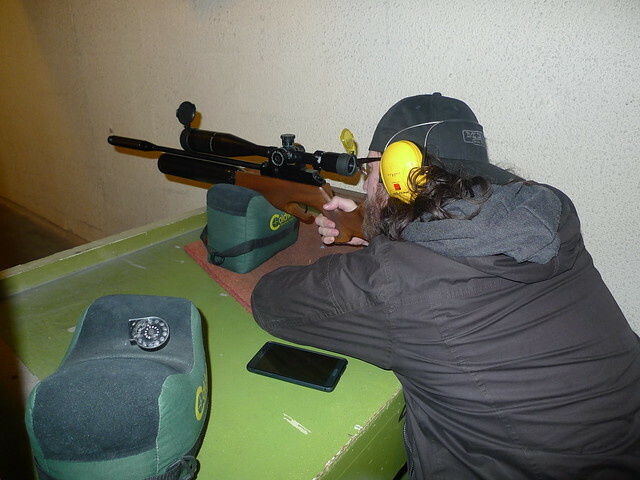 I’m not sure if this was because I wasn’t giving the bolt enough time in the rearward position to fill the chamber consistently, maybe because I was just not aiming particularly accurately. A bit better grouping, 3rd target, 12 rounds. First couple of shots were dead on, but then the group dropped. 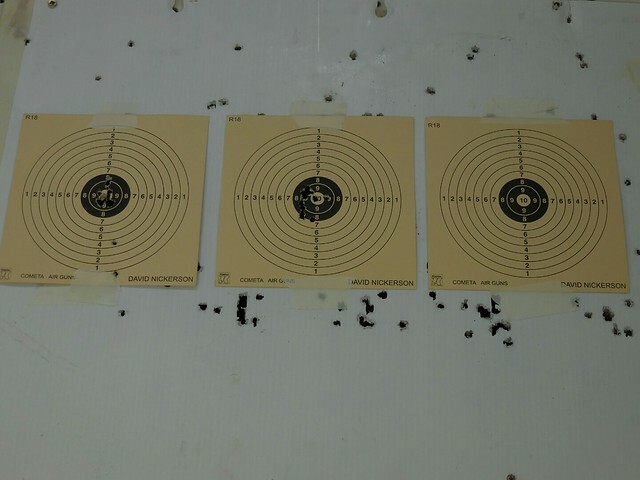 Aside from my flier in the 9 ring, it’s not a particularly bad 12 round grouping.The first and last targets would both first all shots (apart from where I loaded 2 into the chamber at once) onto a 10p piece. The last card fits all shots under a penny. 25 yard firing point. Off a bag rest from the seated position. And one of me on the firing point for good measure! The results of this rifle deteriorated, see the follow up blog regarding this and our efforts to fix it on Theoben Rapid S Repair blogpost. Cool app. 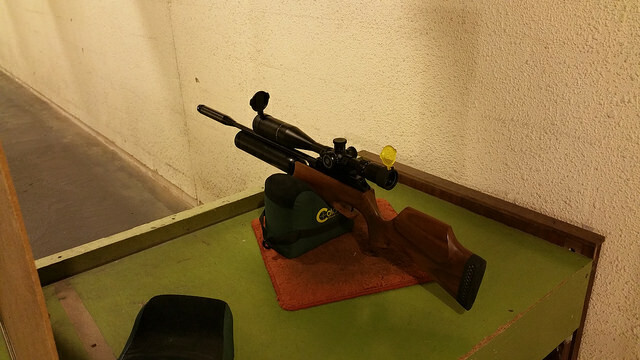 It would be very helpful for rifle shooting practice. What really interests me is about that sniper scope, what scope is that? I believe it is a slightly older Hawke Sidewinder 30, Without illumination. Hawke Sidewinder 6.5-26 x 52. It’s a great optic for the price range!